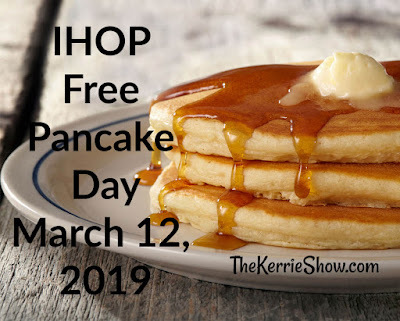 IHOP Free Pancake Day is March 12, 2019 this year, and we are going to partake! Here's a post from when we did Free Pancake Day in 2016. March 12, 2018 was a very sad day in my household (a miscarriage and my husband being hit by a car on his bicycle). This year we choose to be thankful for what we do have (5 healthy kids and a husband who is alive and well) and HAPPILY EAT PANCAKES! "On IHOP Free Pancake Day, visit any IHOP restaurant and get a FREE short stack of our Original Buttermilk Pancakes. Then donate to help children battling critical illnesses. Each stack served on IHOP Free Pancake Day helps us flip it forward for kids in need. Doing good never tasted so good." Click here for more details on IHOP Free Pancake Day 2019 and to see stories of kids you'll be helping out, and also check out their menu to plan your entire meal! We love to order bacon and OJ with our short stacks (coffee for Mommy! ).